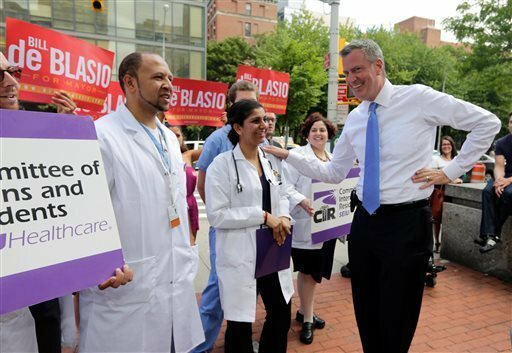 In the above photo, uber-progressive NYC mayoral candidate, Bill de Blasio recently accepts the endorsement of the Committee of Interns and Residents (CIR). Note that the Committee of Interns and Residents is part of the infamous Service Employees International Union (SEIU) which is known for their use of the persuasion of power. Ask yourself, is this the new face of medicine? Read more at: newsobserver.com. This entry was posted in Healthcare, Unalienable Rights, Unions and tagged Anthony Weiner, Bill de Blasio, Committee of Interns and Residents, New Yory City mayoral race, persuasion of power, SEIU. Bookmark the permalink.